Operators: Akkuratov E., Maksimov L., Orlov Yu., Filatov I., Havchin A. 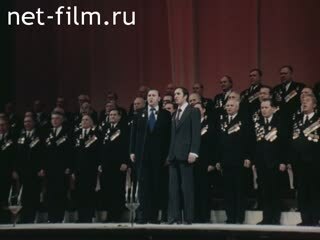 On the final concert of the All-Union festival of amateur October 7, 1977 in the Kremlin Palace of Congresses. Winners of the Nizhny Novgorod act in the factory shop. The members of the ensemble "Vartovchane" and propaganda team "Samotlor" appear on the drilling station in the Tyumen region. Supports VIA "Apsny-67" from Sukhumi. Tashkent, adult actors applauded the dancing children. Dance veterans group "Abkhaz centenarians." Speech song and dance at the stadium in Vilnius. 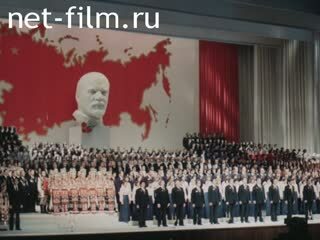 October 7th, 1977, Kremlin Palace of Congresses, the audience filled the hall. Alternation: applause, members of the Politburo in the box, cheering the performers. Inauguration of the final concert. Choir sings "Song of the Motherland" I.O.Dunaevskogo poems V.I.Lebedeva-red bunting. Mashnich performs "Song of the Party card" composer V.A.Zabyvaeva. Consolidated Statement of dancing ensemble of actors Arkhangelsk, Voronezh and Magnitogorsk. Supports children's dance ensemble from Riga. Chorus veterans of Voroshilovgrad (Luhansk) performs the song "Little Earth" A.N.Pahmutovoy poems N.N.Dobronravova. Choir of the Moscow garrison performs the song "Invincible and Legendary" A.V.Aleksandrova poems O.Ya. Engineer ZIL T.Kozhakova singing ditties about the accordion. Soloists of the Ballet Theatre of DC plant "Hammer and Sickle" R.Holodkova teacher and engineer K.Skryabin perform the play Tchaikovsky "Meditation". Members of the ensemble of modern dance ballroom dances. On stage, the chamber orchestra of the Yerevan Polytechnic Institute. Speaker of Azerbaijani folk orchestra. Performs Folk Orchestra of Kazakhstan. On the stage of the Academy of Sciences Male Choir of Estonia. Female choir Kyrgyz Pedagogical Institute. Mixed choir Latvian farm "Cesvaine." Speaker ensemble "spark" of the Kirov region. Chief Agronomist farm "Friendship" Kostroma region T.Inozemtseva reading poetry. Ensemble "Spring dawns" from Voronezh sings ditties. Performs dance ensemble "Ranitsa" from Belarus. Dance ensemble of soloists "Tbilisi". Ensemble DC Lviv plant "Electron" performed a comic dance. Dance students at Vilnius University. Dance students of the Turkmen Agricultural Institute. Speaker ensemble Kishenevskogo Youth House. On stage, dance ensemble "Youth" from Ferghana. Men's group folk ensemble "Agidel" Salavat performs the dance of horsemen. 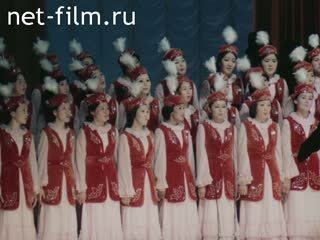 Song and Dance Ensemble "Bacchus" from Tajikistan performs the dance "Song of the Mountains". Consolidated Acts dance troupe of artists of Leningrad, Arkhangelsk, Voronezh, Kirov, Volgograd, Stavropol and Krasnodar regions. Sings choir participants of the final concert of the festival. Singing the anthem of the USSR. Panorama auditorium. Parting cheering performers and audience.